Welcome to the official website of freelance saxophone performer and teacher Nick Smith. Nick's performance schedule probably takes him to a theatre, concert hall or arena near you soon, please check the links to Nick's current projects to see him perform on Debra Stephenson's "Night of 100 Voices" tour, with the Tin Pan Allies, Jimmy James and the Vagabonds, or possibly Thoroughly Modern Jukebox in the near future. In addition to performance, Nick works as a saxophone and clarinet tutor in the Dorset/New Forest area, teaching either at home, via Skype or Facetime, or at the home of his students at their preference. If you're interested in saxophone lessons, please check out his Teaching page. Nick's work often sees him appearing as a 'deputy' in many other bands around the UK, more details of which you'll find within this site. Nick is happy to play in a variety of styles, blues, soul, funk, jazz, even classical and romantic! 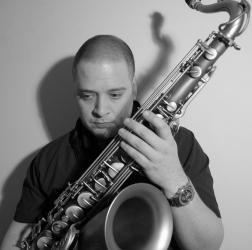 Nick is also able to provide solo saxophone services for your wedding or event. Fully covered by public liability insurance, and self-contained with his own PA system, Nick can provide background entertainment, or upscale to a full band catering for your needs. Find Nick on Encore here. "Nick recently played at our wedding during the ceremony and drinks reception. Nick spent lots of time emailing before the ceremony to ensure we were happy with song choices which was such a lovely touch. Nick was absolutely amazing on the big day, it sounded incredible. Lots of our guests also came up to us commenting on how brilliant he was as well. I would definitely, definitely recommend. To contact Nick about his roles as performer or teacher, click here. Please explore - happy browsing! Here are some examples of Nick's playing career. First up, some tenor sax blues solos performed live at Portsmouth and Southsea, with Jake and Elwood. Next, a track from the demo CD made by Mulligan Soup, featuring Nick's baritone sax.